It is very unlikely that you will find a wedding dress that fits you perfectly. Any dress you buy off-the-rack will require minimum alterations, so it is just right for you. Hence, it is necessary that you set aside a part of your wedding dress budget to account for alteration costs. The amount you will have to pay for altering your dress depends on the extent of work that has to be done. So, the less work your dress requires, the lesser you will have to pay to get it done. Keep this factor in mind. Let us now look at how you can minimize your wedding dress alteration costs, by first choosing your dress properly. When the dress size is accurately chosen, it will require minimum work to fit perfectly. When you choose a dress that is much bigger, remember that the measurements will be bigger not just for the sides, but for the neckline, the shoulders and the bust. So, just taking the sides in will not do. You should ideally choose one that is no more than one or two sizes bigger, so altering it won’t be too difficult. 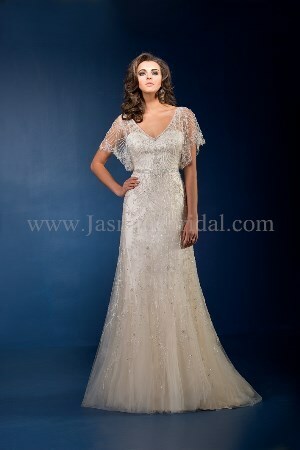 The more embellishments the gown has, the more difficult it will be to replicate the look when it is altered. So, you will have to pay for the effort that goes in. A gown that has less detailing, or doesn’t need much work around the embellishments, can save you some money. Also remember that the more fabric a gown involves, the more work it will correspond to. So, it is only logical that a ball gown skirt will cost more than an A-line skirt when being altered. 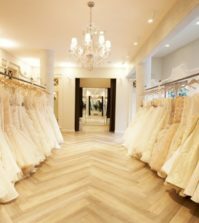 If you are certain that you want your wedding dress to sport a certain neckline or have sleeves, it is better to look at gowns that already have this feature, than choosing another and having it customized with this factor. Transforming a gown to look different is expensive, and it may sometimes end up losing its original charm in the process. A gown with a corset-back usually requires little to no changes in the bodice to fit you, when chosen in the right size. Where the skirt is concerned, it will be easier to shorten a wedding gown that doesn’t have too many details at the hemline, as it can be cut to the right length without worrying about losing any details. If you choose a longer gown with an embellished hemline, it will have to be shortened by taking fabric out at the waist, and this takes more effort and time. On a final note, remember that wedding dresses are complex garments, and not everyone may be able to work on it. In your attempt to save money, don’t make the mistake of entrusting the job to someone who isn’t familiar with wedding gowns. Keep the above points in mind when buying your wedding dress and have the alterations done by a professional seamstress, so your wedding gown will look just right for your big day. For more wedding tips and advice, visit us on Best for Bride. I think if you try to find a dress that fits you best BEFORE the alterations, there will be less to be changed, therefore saving you money. It’s great that you elaborated that a gown with fewer details can save more money since there are not many embellishments to work on. My sister will get married this year, and she is going to start looking for wedding gowns next week. I believe that she plans on getting a gown altered because it is quite difficult to find a gown that fits her body type. So these tips would really help her in the future. Thanks!